joelene wolfe, Happiness depends on different things to different people. Learn how to follow YOUR happiness one step at a time. Going with the flow is not a new concept. I’m sure through the course of your life people have told you to “go with the flow”, “let go and let God” or that things “ebb and flow”. They probably told you this for good reason. Maybe you were holding onto something too tightly or perhaps you had a problem with change. We all have been there at one point or another. It is actually good advice but how do we take those little nuggets of wisdom and put them into practice? Let me relay it in terms we can all understand — a recipe. I know — this all may seem a little woo-woo but simply put, it’s about being flexible. In other words, we can’t control every situation and I’m not sure we want to. I mean how boring would life be if we could pull every string just the way we wanted? That would be fun for a minute and then boredom would set in. If we’re able to be flexible in life, we may just receive something better than we ever imagined. Now that would be cool. If you think about it, both stress and control can affect us letting the good stuff in. But there are simple tricks that may help. Try this… just relax your shoulders. I tend to place all my tension in my shoulder and neck area. Many people do — even my 16 year old. My daughter is learning to drive and every time I look over at her, I can see the tension in her body. The first thing I tell her when we get in the car is to relax her shoulders. She always laughs, then releases her stress and you can almost see a ten pound weight fall off of her. 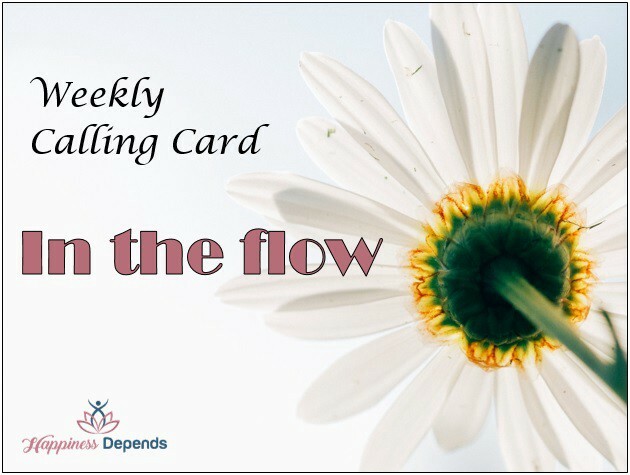 She has to consciously give up a little control in order to go with her flow. The other area we show stress is our faces. Try relaxing your face throughout the day. You may be thinking — what the heck is she talking about?! You see, I am known to have an expressive face. As an actor this is usually a good thing but a poker player I will never be. I find that I wear my feelings and stress on my face. When I remind myself to relax it and smile, I actually feel a hundred times lighter. Whatever the tactic, the most important take away is that we cannot control everything. Getting in your personal groove involves trusting the process and enjoying the ride. If we allow stress to take over, we block the good things from coming in. So let it go and let it flow. Joelene is a mom, wife & marketer who decided a few years ago to take the leap & follow her life’s dream of acting. Now she loves every minute of it and is helping others follow their dreams.